Would you believe us if we told you that Hot Wheels makes as many vehicles in a week as Volkswagen, the world’s biggest carmaker, did in the whole of 2017? The figure, you ask. .. a whopping 10,7 million units. Over the past 50 years, the brand has been an integral part of every petrolhead's path from snotty kid to adult kid. Hot Wheels almost always preceded the likes of Scalextric, Tamiya, and video games such as Gran Turismo as our first entry point into the automotive world. It taught us, not only about cars and brands we'd only seen in movies, but how to use our imagination and, ultimately, how to have automotive fun. Back in 1966, Mattel founder Elliot Handler first planted the seed of creating a new and exciting way for kids to experience ‘vehicle play’. The thrill of the custom hot-rod culture had defined the American automotive landscape post-war and he felt kids should have a way to enjoy it too. This was just five years after his wife, Ruth, had created another mid-century toy icon, Barbie. Commenting on the speed at which the prototypes rolled along the floor, Handler is said to have exclaimed: ‘Those are some hot wheels!’ And the brand was born. The first line of 16 vehicles hit shelves in 1968, known as the Original Sweet 16, and eleven of these were designed Harry Bentley Bradley, an ex-General Motors automotive designer who had penned several designs for Detroit-based custom coach builders, the Alexander Brothers. These 16 vehicles included the very first model off the line, the Custom Camaro – based on the brand new 1967 Chevrolet Camaro – as well as Bradley's most famous design, the Dodge Deora forward-control pickup. Others in the Original Sweet 16 were other contemporary pony cars at the time such as the Mustang, Cougar, Barracuda and Firebird. Each featured a sparkling ‘Spectraflame’ paint scheme – a coloured lacquer over a zinc-plated casting – and other unique touches that echoed the era’s car culture, such as side-exit exhausts and staggered wheel set-ups. A diecast of more than 20,000 different models have been created, pretty much every vehicle you can think of including many complete ground-up custom models. Currently, over 130 new car designs are introduced each and every year. Mattel has a dedicated team that renders both real-world cars and entirely new custom vehicles in miniature form. They do everything, from a branded car for one of the company’s 350 partners to a new variation on the hot-rod theme, or a Star Wars or Toy Story character car. Speaking to evo.co.uk, Jun Imai, who has been at Hot Wheels for 14 years and leads the transportation design team, that variety is one of the highlights of the job. 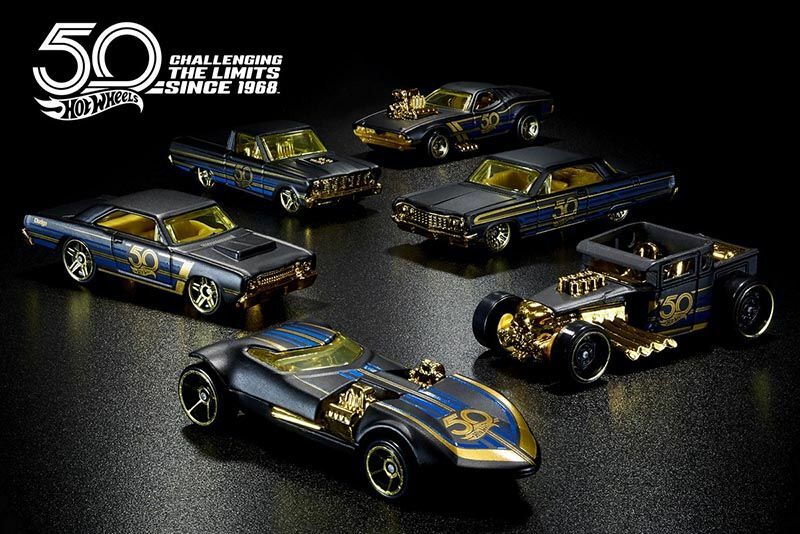 He says about three-fifths of the designs are licensed replica vehicles of modern cars and classics you’ll see on the road, while the remainder is what the company calls Hot Wheels Originals, pop culture-themed toys and fantasy vehicles directly from the imaginations of the designers. His fellow designer, Ryu Asada, who owns both an S2000 and a first-generation NSX, has pushed several Honda designs onto the shelves, while other members of the design team are Porschephiles or desire American muscle cars. This variety inevitably influences the diverse design of new 1:64-scale models each year. This passion for cars leads to high-profile collaborations to create miniatures based on customised real-world vehicles, such as with Fast & Furious franchise star, Sung Kang, and famous car collector, Magnus Walker. Imai goes on to describe the collaboration with Walker as a ‘very organic process’ that inspired a line of Urban Outlaw cars, from 935s and GT3s to a replica of his famous ‘277’. The result of Imai and Kang's vision is a pumped-up replica of Kang’s custom Datsun 240Z named ‘Fugu Z’, ultimately spawning several other custom 240Zs, including a take on Imai’s own wide-arched Z-car. When it comes to creating non-licensed vehicles, Imai describes it as a ‘different mindset’. This involves not just imagining individual vehicles but includes an entire world in which the cars operate, with different roles assigned to different vehicles. Imai told evo that "the team will always design vehicles as if they’re real cars, though, with space for drivers and powertrains, however fantastical the overall shape". Take, for example, the full-scale, functioning replica of the famous Twin Mill that the company built for the SEMA show in 2001. Imai explains that the diecast cars are designed to function, for instance, on the bright orange track that Hot Wheels is also famous for. The size of this track has led to fairly consistent requirements from the 1:64-scale models and has lead to standardised wheel sizes and enough ground clearance for the cars to negotiate a loop at high speed. Modern production techniques allow designs to become "more true-to-life and more complex", says Imai, they’ve "been able to implement some of the techniques discovered by the company’s huge customising fan base to improve castings". As the company moves forward, those castings will evolve in response to new developments too in the same way that we reminisce over the manufacturing process of the era of early cars like the Deora, Whip Creamer and Twin Mill. Imai goes on to say that electric car market is what is interesting to him now. Especially the way it’s "allowing smaller car makers to make a bigger impact in the market", how that affects materials technology and, ultimately, car and toy design. "I’m keen to do more in terms of motorsports, too," he says. "Formula E, in particular, is super exciting – the thrill and the speed of motorsport, but a consideration for environmental concerns, too." We share his sentiments when Imai says, "I’d love to bring back some of the older cars. They’re still an inspiration for us. Perhaps replicating some of our Original Sweet 16, but produced with the technology we’re now able to incorporate." Salute, Hot Wheels, for bringing half a decade of joy to the world. Here's to the next fifty and to another few generations of petrolhead pleasure. Check out the video below for a brief evolution of Hot Wheels, or click here if you have three hours to watch the official YouTube channel of their very own 50th birthday celebration. Video: Changing Wheels On A Car While Driving. Only The Saudis Can Be This Crazy!